Fl 282 V3, horizontal stabilizers with end plates, glazing in front of pilot only. The most important modification Flettner made to the design of the new aircraft was to re-locate the engine behind the pilot's seat, which gave him and the observer a much-enlarged field of view. 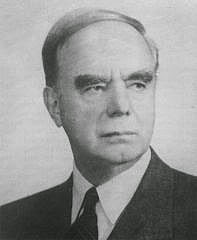 The drive was taken off the front of the crankshaft through a reduction gearbox and transmitted up and back through a universally jointed drive shaft and a cross-shaft connecting the two rotor shafts, which were set at an inclusive angle of 24 degrees, and inclined forward by 6 degrees. The rotor blades were mounted so that they were parallel when they were at 45 degrees to the aircraft's centreline. The fin and rudder were much larger than in previous Flettner designs, steering being accomplished by a combination of rudder movement and differential collective pitch control. The 'Kolibri' proved to be very satisfactory indeed, despite a pronounced vibration period as the engine was run-up, with a maximum speed in level flight of 150km/h (93mph), a vertical rate of climb of 91.5m/min (300ft/min), a hover ceiling of 300m (985ft), and a service ceiling of 3290m (10,800ft). Its range, with just the pilot and maximum fuel aboard, was 300km (185 miles). Some 50 pilots were trained to fly it, most of them by Flettner's test pilot, Hans Fuisting. It was extremely manoeuvrable and very stable and at forward speeds in excess of 60km/h (37mph) could be flown hands-off once the controls were balanced. From 1942, trials at sea aboard the cruiser Köln demonstrated that the aircraft was usable even in very poor weather conditions, and by the following year, 20 were in service with the Kriegsmarine in the Mediterranean and the Aegean. In 1944, an order for 1000 Fl 282s was placed with BMW, which began tooling up for production at its Munich and Eisenach plants, but before manufacture could begin, both they and the Flettner works at Johannisthal were very badly damaged by Allied bombing. 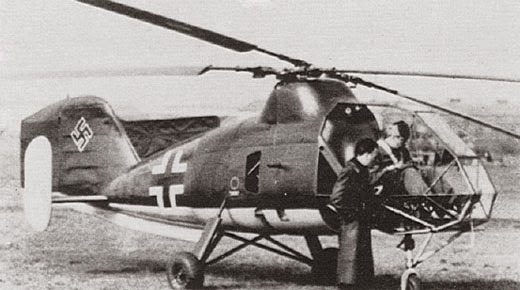 Anton Flettner went on to design a 20-seat passenger helicopter, the Fl 339, but never got beyond the development stag. First World War, Flettner continued working on many innovative and successful projects. 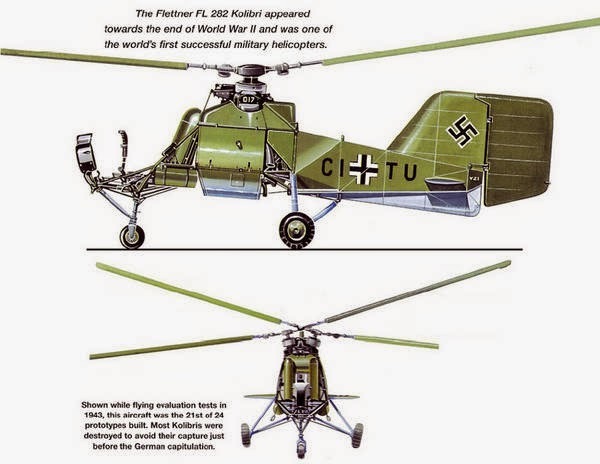 Flettner Fl 184: A gyroplane. 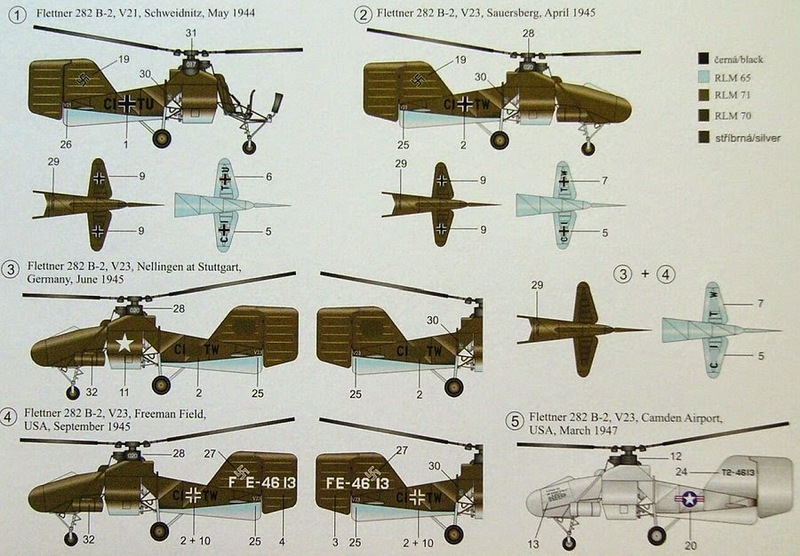 The only single-rotor helicopter built by Flettner; all others had twin, intermeshing rotors. Single prototype destroyed in a fire; though the Kriegsmarine did have a strong interest in the capabilities of the aircraft. Flettner Fl 185: Continuation effort of the Fl 184. Built more for design and testing purposes than anything else. Flettner Fl 201: An enlarged Fl 185. Provisions for carrying 35 +/- passengers. Design only, none built. Flettner Fl 265: Built for the German Kriegsmarine in 1938, but the program was stopped because the KM found the Fl 282 to be more optimally suited for its needs. Only six were built. In an interesting twist, the Fl 265 was “combat tested” against a Fw 190 and Me 109 in mock battles - both fighters were not able to score a kill against the agile Fl 265 (this was recorded on film). Flettner Fl 285: A theoretical design intended to fill the needs of the German Kriegsmarine. None were built. 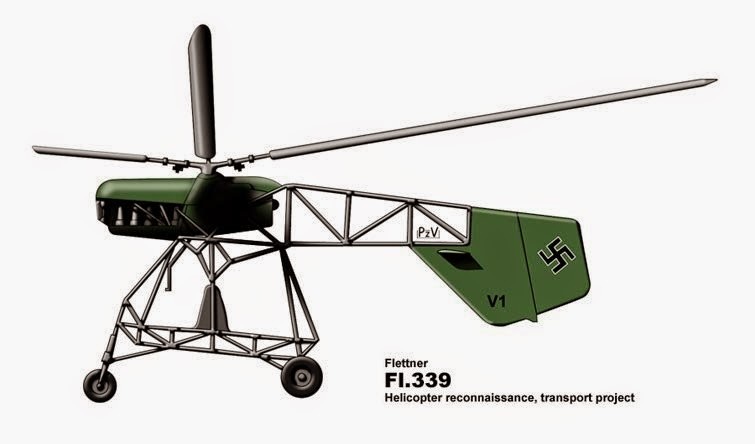 Flettner Fl 339: The Fl 339 was intended to serve the needs of the Wehrmacht as a communications, liaison and aerial observation platform. Two/four seaters were planned. None were built as the project was canceled.